Luminar 2018: A Viable Alternative to Adobe Lightroom? Luminar 2018, which is the latest edition of photo editing software from Skylum, is arguably one of the most advanced photo editing solutions available in the market. The product offers a great competition to Adobe Lightroom, which is available to users through a monthly subscription fee. One of the most significant aspects of Luminar is its advanced filtration technique and editing algorithms. These attributes make it fast-paced and easy-to-use software. The biggest benefit this software carries in the eyes of consumers is its one-time price of $64. Consumers can own the software by paying the purchasing fee, rather than making ongoing monthly payments. The software is a great photo-editing tool for pictures taken from popular, high-end cameras, including Nikon, Fujifilm, Canon, Sony, and Panasonic. Provides the same level of speed, efficiency, and convenience to Mac users as it does for PC users. Luminar is quickly proving itself as a one-stop shop for photo-editing needs. It uses a non-destructive, layered platform for photo editing. This means the raw image is in the first layer and the filters and edits are in separate layers. Since an image can consist of multiple layers, it is easier for the user to backtrack and change or undo an edit. A great benefit of using Luminar is the producers of this software take customer feedback seriously. They constantly make improvements accordingly. Initial versions of the software took more time to open larger files and for adjustments to take their effect. The latest 2018 version is faster than ever before and resolves this problem for its loyal customers. A usual Luminar photo-editing screen would consist of the photo on the center with processing toolbar on the right. 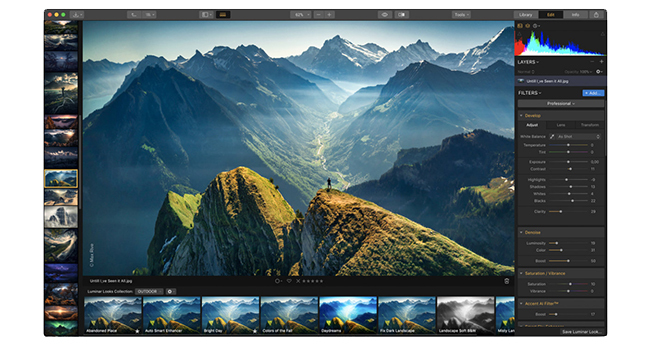 Users can customize the processing toolbar to include standard professional features available in Adobe Lightroom. This feature will allow users to transition easily from Adobe Lightroom to Skylum Luminar. Another benefit of having a customizable user interface is that it helps increase user-efficiency and reduces the time required to finalize the image. The latest upgrade of the software offers enhanced speed in opening the files and processing images. Users running Windows will witness a speed jump of 5 times in this photo editing software. Mac users, on the other hand, can experience a 12 times boost in processing speeds. One of the significant attributes of the Luminar interface is its workspace options. These workspaces offer a selected choice of options that can be used for a particular type of photo. There is a different workspace template for black and white portrait or an aerial view image. The main benefit of these workspaces is that there is no need to navigate to commonly used photo options every time they’re needed. Lightroom offers some advanced photo editing options including managing photos on the cloud. The new photo organization features will increase the efficiency of Digital Asset Managers by more than 50%. The revitalized interface will show multiple pictures on one screen you can choose from. Once you select an image, a side bar will allow you to switch between the image on board with others in the library. Another big difference between Lightroom and Luminar is the subscription-based model of payment. Lightroom users have to pay a monthly subscription fee in order to use this software. Luminar, on the other hand, is a one-time purchase. Consumers only pay more for add-ons and software upgrades. The user interface for both Lightroom and Luminar get high marks. However, between the two, the GUI for Luminar takes the trophy. It is not always the most complex features that make software more useful. A photo-editing tool that consists of standard features and that can provide ease of use for the user can take the number one spot as well. Although Luminar 2018 provides an efficient and cost-effective alternative to Adobe Lightroom users, the product is relatively new in the market. It has not gone through the extensive testing by users that its rival has gone through. It provides promising photo editing features, but the facts and figures regarding its effectiveness and ease of use remain to be seen. All in all, it is a perfect solution for amateur as well as experienced photographers who wish to refine their images using an easily accessible software. Previous Post« Previous How Does the New Apple Watch Series 4 Compare to Past Models?